The Safe Routes to School program enables our children and young people to walk, scoot and ride a bike to school more often and makes our communities safer, healthier places for everyone. The ‘Safe Routes to School ‘program (SR2S) links the needs of each school community to local actions in and around schools to make the choice to ride and walk to school simpler, safer and more fun. The program relies on working with each school community to determine the needs of their school, provide skills and road safety training, technology to ensure parents know that their children have arrived and when they leave. It includes a range of supporting activities and resources to boost the physical activity kids are able to undertake in-school and on the way to and from school each day. Want to support Safe Routes to School? Online web-based platform that translates engagement into benefits for the school in addition to providing educational, parent, teacher and student resources. GIS data-based mapping framework to provide a toolkit for each school that identifies safe routes between home and school and barriers and gaps in need of attention/funding for remedial works. Use of smart tech for rewards, engagement and measurement of active travel. Co-design workshops with parents, schools for planning and intervention. Why? We have stopped moving! Australian children are not physically active enough to ensure their own long-term health with nearly 71% of those aged 5 – 11 years and 91.5% of young people aged 12 – 17 years not meeting recommended levels of physical activity. 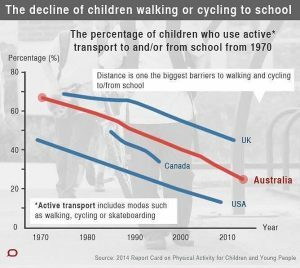 Levels of physical activity in Australia have declined dramatically in the last 30 years. Physical activity ‘habits’ formed as children form the building blocks for future health throughout adolescence and adulthood. to build national policy leadership and engagement (tobacco control, vaccination and transport safety – speed, seat belt – programs are examples where national leadership on a key public health agenda has led to successful population health outcomes). to allow investment and engagement by corporates, philanthropic organisations, federal, state and local governments. to incentivise engagement by, and rewards for, school communities already under significant pressure to achieve national curriculum outcomes. to align national, state and local support for a program that benefits school children and youth and their local communities. A national Safe Routes to School trial funding application was lodged on 28 June with our project partners, the Sunshine Coast Council, ESRI Australia and the University of Canberra’s Health Research Institute. Lodged under the federal government’s Smart Cities and Suburbs Program, the ‘RideScore Sunshine Coast Trial’* will utilise smart tech to build on work done by the Council to engage children and respond to key concerns experienced by parents around independent travel to school. The trial will establish a scalable national model for a SR2S program that can be rolled out through Councils across the country and boost walking and cycling to school. Future partnerships will be sought with the many successful providers of school cycling programs throughout the country. The RideScore Sunshine Coast program builds on the success and learnings from the RideScore pilot and is the first crucial step in creating the Safe Routes to School program nationally. The program is designed to support healthy/active and safe lifestyle choices for students and their families whilst at the same time reducing traffic congestion around schools in peak periods. The program is a game changer as it incorporates personal sensors, real time arrival and departure notifications for parents, GIS mapping and a web-based engagement and data analytics platform to identify safe travel options and incentivise more active travel through gamification and wayfinding support. The platform provides critical data to local government and other approved government and non-government users to guide community infrastructure improvements, measure reductions in carbon emissions and to increase school-related road safety. If you would like to see happier, healthier kids riding or walking safely to school, find out how you can do more, by visiting our Support Safe Routes to School page. The trial is expected to be conducted from early 2019 until late June 2020. We Ride Australia has committed to co-fund the trial with the Sunshine Coast Council, Stocklands and corporate partners. Increase children walking, scooting and riding to school on the Sunshine Coast. 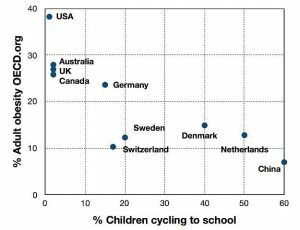 Trial of an integrated national approach for a national Safe Routes to School scheme enabling 3.7 million Australian children greater opportunity to be active and healthy. 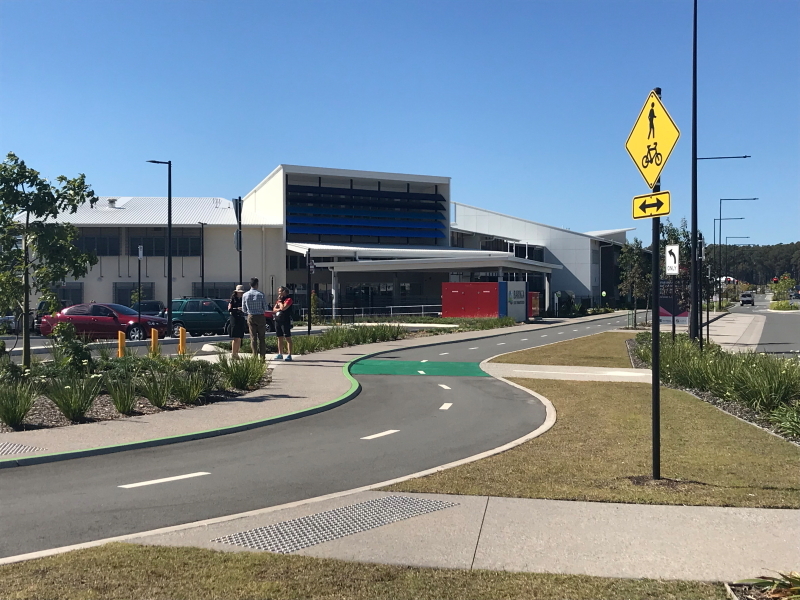 The RideScore Sunshine Coast trial is designed to address the challenges for local independent travel to school by students walking, scooting and cycling. The challenges for independent travel to school are widely recognised by Australian governments at all levels, by health experts and the community and a response that addresses this lack of physical activity by our children and young people and options for safe travel to school is broadly recognised as an issue of national significance and one worth solving. We Ride Australia is a signatory to the Australian Health Policy Collaboration’s ‘Active school travel: pathways to a healthy future’ policy. Download here.